Copyright 2018. All rights reserved. Reproduction or use of editorial or pictorial content of any manner is prohibited without written permission. aroundkent accepts no responsibility for solicited materials. It is extraordinarily difficult to be a young woman in today’s world; a place where teenage years are filled with feelings of inadequacy, questions of self-worth, and an abundance of societal pressures. Mass media implies that a female’s true value lies in her appearance, not in her words or actions. The looming pressure to be perfect often lingers as young women exit their adolescence years and enter the workforce as professionals. inward and find strength from within to overcome these hardships. “Somewhere along the line, I learned to use all of these things to make me a more ambitious me”, she recalls. Luckily, she did not have to face all of this alone. Alicia was fortunate enough to be a part of college preparatory programs, such as Upward Bound, that helped her overcome adversity and achieve academic success. As a result of her experiences, Alicia became passionate about helping adolescent girls and young women overcome obstacles that prevent them from pursuing the lives they desire. Limitless Ambition is a nonprofit organization that was founded in 2013 with the purpose of empowering young women through career coaching, academic assistance, and emotional guidance. “Dream, Believe, Achieve” isn’t just their motto; it’s the mindset that fuels Limitless Ambition’s Founder and Executive Director, Alicia Robinson. For as long as she can remember, Alicia has wanted to help young women become the best version of themselves. Despite many roadblocks standing in her way, Alicia has been able to build her career around this passion. Alicia is a two time graduate of Kent State University, and also works full-time at Kent State University as the Assistant Director of the Women’s Center. In this role, she is responsible for developing strategies and identifying resources for programs, services, and advocacy to secure equity of experience and resources for female identifying faculty, staff, and students on campus. Headquartered in Akron, Ohio, Limitless Ambition aims to preserve, protect, and promote the vision of young girls and women who may have been discouraged from pursuing their long-term goals. Through their Purposely Chosen Women leadership program, their Purposely Chosen Teens adolescent program, as well as a variety of group workshops, Limitless Ambition provides the resources and support women need to realize and maximize their potential. development. Their past workshops have included: Pushing Past Pain to Pursue Passion (Women Empowerment); Vision Mapping: Bring your Vision to Life! ; Entrepreneurial Goal-Setting; and Academic Coaching and Career Planning. Limitless Ambition recognizes the advantages of establishing and fostering partnerships with other community organizations. They have recently formed a partnership with Akron Metropolitan Housing Authority to bring Purposely Chosen Women to female residents who desire economic self-sufficiency. They have previously partnered with Akron Public Schools, Warren City School District, and Cleveland Metropolitan School District to bring our Purposely Chosen Teen program to both middle schools and high schools in these districts. In addition, they have facilitated a wide variety of workshops with Kent State University. In addition to educational institutions, Limitless Ambition also has a history of collaborating with various community organizations such as Upward Bound, Girl Scouts of Northeast Ohio, the YWCA of Summit County, and Akron Public Libraries. to career programming, the result is a comprehensive and unique service to the Akron community. Alicia Robinson founded her inspirational organization to follow her own passion for helping others discover their professional potential and self-worth. Her path to success has led her to understand the value in this cause and the amazing potential Limitless Ambition has to benefit women of all ages. Alicia selflessly reflects that the work she does “is all about giving back” to the generations of women who come after her. To the adolescents and young women who question their own value and face barriers to success, Limitless Ambition is your answer. It is your community, network, and safe space. To learn more about Limitless Ambition and how you can support their mission, please visit www.LimitlessAmbition.org. Mark Allender: So Mike, how did the collaboration with Samuel come together exactly? working together, and in the years since, he has become one of my closest friends. He has been sharing tracks with me on his collaboration with Samuel, and it has been wonderful watching these rough tracks develop into the finished album. Mike has told me that this is the recording he is most proud of, where he really achieved what he set out to do. And when the opportunity arose to do an article about the project, I jumped at the chance – this is some great music. Th to our stage shows. He always shows up with racks and racks of gongs from around the world and a huge collection of singing bowls. Mark: And frankly, what is a live show without a collection of singing bowls? Mike: Exactly! Samuel is currently heading back to India to continue his study of the sarangi. When he gets back in the Spring, we will be performing a few more gigs, including one on May 12th at The Silk Mill in Kent (145 South River Street, Suite 5 in Kent, Ohio 44240). In those gigs, we will be performing with Joe Culley, who is a local legend for his tabla** playing. things Hovancsekian, I have come to appreciate the way Mike can create an environment. And that is what this album gives you; thirteen distinct environments, each with their own aesthetic and their own laws of physics. All while Samuel steals you away ala Pied Piper. Catch these guys out in concert, if you can. Live shows include a vast array of exotic sounds and instruments from around the world, exciting improvisational exchanges between the musicians, projected video collages by Mike Hovancsek, and often a market experience, with food and hand crafted items for sale. This isn't just a concert; It is a multi-sensory experience. The new album The Market of Kashi is available thru Spotify, Amazon, iTunes, CDBaby, or at local music stores in northeast Ohio. zithers, percussion, and various other instruments. When Salsbury really lets loose on his century-old sarangi (an ancient Indian instrument he has been studying intensively with a guru in Varanasi, India for the past few years), the music is lifted to a truly spiritual height, supported by the ringing out of the instrument’s three dozen sympathetic strings. For me, one of the highlights of the CD is the opening track, “Joyful Flight,” which features a rich pan-cultural instrumentation that includes an African kalimba and balafon (xylophone with gourd resonators). This one really grooves, causing a delightful confusion on the part of the listener due to its unpredictable periodic rhythmic stops and starts. On “Floating on the Wind,” chiming sounds, widely spaced like pillars in a vast cathedral, create a feeling of stilled time as effective as anything by Somei Satoh or Lou Harrison. On “Beyond Existence,” Mike shows off some unique cello playing, this lower-pitched bowed instrument lending welcome variety to the album’s musical offerings. And in the meditative but emotive “Reflection,” extraordinary ultra-deep sustained tones, seemingly lower than the range of hearing, are felt more than heard, in a way that is subtly but pleasantly disorienting. Mike Hovancsek’s previous releases are all beautifully produced and worth seeking out – and he plans on issuing at least one more new release for 2018.
references to rhythm and pattern and sound and silence. His artworks are often covered with stripes, simple geometric shapes, and spirals and dots, suggesting themes of light and darkness, mass and space, and present and past. Central to Kaneko’s artistic exploration is a sense of play and experimentation, which drives his restless creativity. His large-scale hand-built ceramic sculptures—both dangos and heads—often exceed seven feet in height and weigh thousands of pounds, representing feats of innovative engineering in and of themselves. Many of the works in Blurred Lines are drawn from the artist’s private collection and represent transformational works in his over 50-year career. Jun Kaneko: Blurred Lines is organized by the Akron Art Museum and supported by funds from the John S. and James L. Knight Foundation and the Ohio Arts Council. Media sponsorship by ideastream®. Jun Kaneko: Blurred Lines Opening Party Friday, February 16, 2018 • 6 pm Be the first to experience the groundbreaking, monumental works of internationally renowned artist Jun Kaneko at the Akron Art Museum. Chosen for their powerful yet contemplative presence, many works featured in Blurred Lines are drawn from the artist’s private collection and represent transformational moments in his career. See how Kaneko pushes the boundaries of ceramics, sculpture and painting, all the while melding influences from the East and West. Members-Only Preview at 6:30 pm Exhibition open to all at 7:00 pm. Museum members receive special offers and discounts throughout the night. and new technologies. An engaging vitality results that enriches viewers’ connection to the world around us. //benitez_vogl – the artist duo Margarita Benitez and Markus Vogl – redefine what it means to be an artist today. Their efforts point to new potentials of creative endeavors while linking areas of inquiry that might once have been seen as independent paths. They employ a rigorous practice of combining highly innovative materials and methods toward unexpected and varied ends. Featured here are three of their many projects, as described by the artists. i<3 is a site specific interactive installation that behaviorally changes based on twitter hashtags that have been published. The hearts light up based on the amount of human current and flow. Each 1/2 of a heart lights up once a certain number of tweets has been reached. i<3 can be adapted to any hashtag chosen and can therefore continue to be shown at different venues. This particular documentation of the installation counted the number of Ingenuityfest tweets based on the hashtag #ingenuityfest as it was installed at the 2011 Ingenuityfest in Cleveland. evidence of movement and display. A delicate balance is struck here between the effort to create beautiful photographs and the impulse to comment on the way in which women are viewed and often objectified in our society. As Tavakoli delves into his subjects, he fully commits to exploring, through many striking examples, both the formal construction and the complex content of the images. Another major body of work – the Dress Series – is described by Tavakoli: The dress is a symbolic rite of passage for women. Its feminine form marks significant events throughout a woman’s life. From communion at age of seven, to school dances like Homecoming and Prom, to formal engagements, all the way to the ultimate white dress, the dress is omnipresent. The dress itself signifies gender, femininity, sexuality, and maternity. Women are conditioned to present themselves as masquerade, a performative display. Women have been subordinated throughout many cultures throughout time. The “damsel in distress” may evoke our empathy; both men and woman feel consumed, but we are socially constructed to make women feel even more confined. I photographed the female subjects in dazzling dresses. I then deconstruct the dress by photographing it in sections, manually manipulating the fabric. I then digitally reconstruct the dress using Photoshop® to transform it into provocative forms. The color evokes a visceral sensation. The resulting effect suggests being trapped, suffocated, limited, insignificant, and invisible in our patriarchal society. consulting business I work at on evenings and weekends. Even though I am taxed at a rate of 40% on my consulting, I still do it because it allows me to provide better for loved ones, purchase luxury items like books, and pay for the seemingly endless physical repairs mandated by middle-aged mileage (disintegrating spinal discs), pig-headed choices (running on bad knees), and previously unknown insults like receding gums (not all recessions are financial). I had some thoughtful responses to part I of the American dream article and the ideas presented in it. Two friends, one from Canada and the other from the United Kingdom noted that I am writing a human – not just American – dream, yearning for a life guided by the richest values of humanity. Human beings gravitate toward freedom like plants toward sunlight – “freeliotopism”, my one friend calls it. I accept their point, but in true American fashion, we Americans have “branded” the idea of a life dream – the American dream – in ways ranging from passionate promises to petty propaganda. Another reader noted I had specifically addressed “baby-boomers” and the “greatest generation” and asked about “millenials’ ” American dream. To clarify, both Janine and Ingrid are “millenials”. Their generation (born between 1980 and mid-2000s) is the largest generation in our country (one-third of the population), and has the largest percentage of immigrants and children of immigrants, so their unique perspective is vital in our understanding of the topic. In this article, we will explore what Janine, Ingrid, and Karwana see as the best ways to facilitate the American dream, and the greatest threats to it. “sticker price” of college has also soared, the actual price has remained steady for lower or middle-income students. We need to clarify this when the costs of education are discussed. We also need to discuss innovations in student aid such as simplifying the financial aid process for low and middle income students. This costs about $100 per student, but increases college enrollments significantly. Also, at the cost of $6 per student, mailing or emailing personalized information on college options to students raises their application and enrollment rates. Although there are innovative alternatives to federal and state funding for universities, such funding is still crucial. Unfortunately, Ohio received a grade of “F” on support for public universities. Ohio legislators cut funding by 27% over the past five years. Many legislators believe, shortsightedly, that since only a minority of voters attend university, it is better for their political futures to shortchange the social mobility of all Ohioans. Such legislators need to be called out on their ignorance. but were not necessarily making gains. One of the ironies of the American dream is that we have a high tolerance for income inequality. The classic story is a penniless immigrant lands in America and works her way up. As she earns more, her economic situation improves. If she earns enough, she can move into a higher economic stratum. If the rules of the game are the same for everyone, this tolerance could be seen as a virtue. If, however, the rules are weighted in favor of the wealthiest, then this tolerance becomes an intolerable delusion. In terms of solutions, all three of my students felt that people needed forums for real dialogue; non-electronic, person-to-person, safe spaces to try to understand each other. Such understanding, they said, is critical to recognizing the value of the common good; our common humanity. Karwana is the most outspoken about how Americans need to reclaim their governing representatives and come together to understand each other. He admits this is a challenge because of the influence of the “big money” given to politicians by donors and lobbyists. He believes though, that an awakening is under way. He told me that regardless of what I think about President Trump, he was elected by a disgruntled group of voters who in the past had not voted. Karwana says our best bet is to get to know these people; form relationships so that we can use that relationship to effect changes. Ingrid says that bringing more Trump voters into higher education could also work toward such understanding. Janine is most dubious. She admitted that as an African-American woman, she tends to stereotype Trump voters as misogynistic bigots and the idea of a dialogue with them seems unthinkable. She admits that her mind/brain is fueling these images, but they are also rooted in experiences of prejudice and poverty. She also says though, that if it would help, she is willing to try. Perhaps that is the type of willingness we could all emulate. The willingness, in the face of strongly held convictions, to try to understand each other. A willingness to understand each other across our financial, educational, ethnic, and racial diversity; the diversity that can be a strength or a barrier. tors have lost sight of the common person’s connection to the common good. Karwana likes to tell his students that one of the most adaptable qualities that evolved in human beings is their ability to work together. Even in an individualist culture, no person is an island, and even someone wealthy enough to own an island usually does not grow their own food or clean their own bathroom. Janine sees the loss of community as one of many variables that can drive addiction. This is why 12-step groups have always been a useful complement to therapy for many people. Ingrid described her own aggravation at the idea that under the most recent proposed tax changes, graduate students would pay taxes on tuition awards while the wealthiest among us would enjoy even more tax cuts they clearly do not need. All three agree that opportunity in their American dream is increasingly being impeded by rules weighted to favor the wealthiest. FOR THE GARDENER, SEEDS ARE EVERYTHING. The finished product can either be eaten or planted. You let the bean plants go until the bean pods turn brown and brittle, and then collect your seeds.  B  eans are easy to grow. Just pop them in the ground and water good, if the weather is droughty.  ou can eat some of the immature beans Y green, though they may have strings.  eans are self-pollinating. This means they B won’t cross easily with other bean varieties. By definition, a hybrid can’t be an heirloom.  ush beans don’t need poles or other B supports. Seeds are stored energy waiting for release. A solitary bean seed can produce a hundred more. to raise them properly, they must be started indoors under grow lights during February and March. The expense of all the necessary equipment, though not extreme, is still money best spent elsewhere until you are ready to make the commitment of time and resources. Starting plants is like raising infants. They need constant care (especially daily watering and artificial light). There are many sad seed starting stories out there, my friends. For the beginner, I recommend purchasing your starts from a local greenhouse (my favorite is the Garden Spot on Route 14 in Ravenna). Back in the day, people saved their seeds year after year, observing their plants and keeping the best specimens. new passions, revisiting previous works, failing a whole bunch, and generally bouncing back often. All these experiences are part of their creative profile and serve to motivate and inspire them. This feature tells that story. This issue of The Road Less Traveled explains the path of Frances Mae Resek Rottman, the last living member of the group The Dreamers. 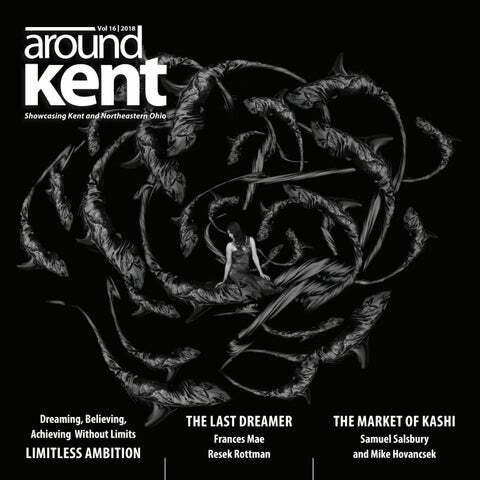 Author note: If a reader would like to suggest someone to be considered as the subject of a future Road, e-mail the publisher at info@aroundkent.net. luck for the coming year. Family reunions and union picnics were common. Life was good. “We had no idea what would have been better,” Fran once commented for an article on the Dreamers. The Dreamers were a microcosm of their community. like “wait ‘til your father gets home”; “children should be seen and not heard”; “no whispering at the dinner table”; “because I said so”; and “a woman’s work is never done” were common. This is the story of the Last Dreamer and of the time and place where she lived. The Dreamers The story begins in 1943 when four high school girls in Lorain, Ohio formed a social club called the Dreamers. In the next few years, they would add a few more members, but kept the group small. They created a constitution and by-laws for the club and even a “club creed” which was recited at the first club meeting each January and at the initiation of new members. They supported each other over the years … community, home, church, and families. Weddings, baptisms, showers, birthdays, graduations, first communions, funerals, and going away parties were all celebrated together.  migrated in the early 1900s, e mostly from Eastern Europe. Frances Resek and Robert Rottman Wed in May, 1948. Continued from page 37 of special luncheons, programs, and events. They were a bit uneasy with all the attention as they just preferred to go about their daily lives with little fanfare.  and Anna Resek were typical Joe of the people living and working in Lorain. There were many ethnic social centers, such as the American Slovak Club, the Polish Club, the Italian American Society, the Croatian Club, and others. There were also many churches (29) of all denominations. The world of the working class people of Lorain revolved around family and friends, their work, their church, their ethnicity (though all fiercely loyal Americans), and their community. Most of the families were large and all lived near each other. A 1956 photo from the extended Resek family is a good indication of the size and closeness of the families of this era. Resek Family Reunion; Approximately 1956: The Last Dreamer is Seated in the First Row, Second from the Left. After WWII, many immigrants came from Mexico and Puerto Rico and were joined by workers from Pennsylvania and West Virginia to work in auto factories. They followed the pattern set by the first wave of workers in Lorain and organized ethnic clubs, joined churches, raised their families, and celebrated their heritage in America. As such, Lorain has always been a city of many nationalities. There are approximately 55 different cultures living there. Even today, Lorain celebrates its ethnic roots with an annual International Festival (68 years in 2018) each summer. The population of Lorain was about 50, 000 in 1950 and peeked to 81,000 in 1975. At one time, there were as many as four high schools (Frances graduated from Lorain St. Maryâ&#x20AC;&#x2122;s in 1946). Today, the population is about 65,000 and there is one high school. such as JC Penney, Sears and Roebuck, W.W. Woolworth, and S.S. Kresge (later K-Mart) anchored both sides of Broadway. Mixed in between them was a hearty assortment of independent stores. Small local chains like Neisners, Hough Bakery, Sutter’s Shops, and Fanny Farmer candies were there. Men and women’s clothing stores, shoe stores, restaurants, and repair shops were common. And movie theatres were a primary part of any downtown entertainment district, attracting hundreds to see the latest movies Hollywood created. In 1944, Lorain had eight movie theaters: Palace; Ohio; Tivoli; Dreamland; Lorain; Pearl; Grove; and Elvira. The Palace is the only remaining theatre, offering a limited entertainment schedule. Next to three of those theatres were the small shops owned by Mr. John Sutter. Continued from page 39 After high school, Frances worked at the Lorain Telephone Company until she married. Some years later, she worked both inside and outside the home as a supervisor for girls at the Lorain County Detention Center for 11 years. The Dream Continues Change was rampant in the 1960s. From bobby sox to bra-less, from the optimism of the Camelot White House to the despair of dead and wounded college students in Ohio and Mississippi (one of the students shot at Kent State University was an Eagle Scout and ROTC member from Lorain). The dream starts to erode with the assassination of John F. Kennedy in 1963, followed by race riots across the country. Later in the 1960s, Robert F. Kennedy and Martin Luther King were assassinated. The Vietnam War was raging, and Richard Nixon resigned the presidency in 1974. It must have been difficult to be a Dreamer in the 60s and 70s. The world they knew and loved was quickly fading away. But they remained loyal friends and supported each other through these turbulent times, just as they had through other life events. The downtown is nothing like it once was, but there are glimmers of economic opportunity. The Palace Theatre remains a centerpiece for downtown entertainment. Clubs like the American Slovak Club and others continue to thrive and the fish fry of wonderful Lake Erie yellow perch is always available … especially during Lent. Some churches and schools have closed, but many remain. her family and friends together as possible. She has four children, eight grandchildren, and seven great grandchildren. Most will be able to join her. Perhaps they will all celebrate Mass together at St. Anthony of Padua Church on the east side of Lorain; her home parish for almost 70 years, where her children went to grade school and her daughters were married (including Sue and I). Though many people have moved away, those who remain in Lorain are hopeful the city can regain its vitality. The waterfront along the Black River and Lakeview Park (on the Lake Erie shore) are once again popular gathering places for families. The historic Lorain Lighthouse remains a beacon, both literally and figuratively. “Patient care is a joint partnership,” Dr. Cheres says. “Working together with patients to accomplish a desired goal is of paramount importance.” Her main goal is to provide patients with accurate information about their condition or diagnosis using evidencebased medicine. In her leisure time, Dr. Cheres loves spending time with her family. She also enjoys reading John Grisham books, playing the piano and clarinet, doing various types of puzzles, and singing. is an orthopedic surgeon specializing in hand surgery for adult patients who have suffered a traumatic injury or a disease that interferes with finger and hand strength, function, and flexibility. “For most medical issues, there are a spectrum of treatments, from giving it time to performing surgery,” Dr. Walter says. “Our goal is to get you better. We will work our way through the options together, trying to be the least invasive, while still getting you back to optimal health.” In his time away from work, Dr. Walter enjoys playing pickup basketball, golfing, and working out. He and his wife like trying out new local restaurants and following all the Cleveland sports teams. is an internal medicine physician who specializes in rheumatology, treating diseases and conditions of the muscles, bones and joints as well as certain autoimmune diseases. Dr. Muoh is board certified in internal medicine. “I believe in a comprehensive approach to diagnosing and treating arthritis, connective tissue disease, and conditions,” Dr. Muoh says. During her time away from the office, Dr. Muoh loves to read, travel, try different foods, and spend time with her family. medical stabilization. During this period, the patient is started on Suboxone, a prescription medication approved in 2002 by the U.S. Food and Drug Administration that treats withdrawal symptoms and reduces the craving for opioids. often experience such as family problems, depression, employment and financial issues, and other drug and alcohol abuse. “To help individuals with these problems and increase their chances for the best possible outcomes, we refer them to the appropriate behavioral health counseling and other community resources for support as needed,” Klaric notes. For more information about Addiction Services at UH Portage Medical Center, visit http://uhportage.org, click "A" under browse services and click on "Addiction Services." or call 844-541-2087. Home Sweet Homepage :-) Introduction “Hello Mary, it is nice to meet you. Please (producing a business card) visit our homepage and find out all about me or my company.” Or, in an email, “Can you believe this? See it here.” Or, “Look at their menu, I am very much looking forward to our dinner together.” These days we rely on the Web every single day and it seems a computer (or smartphone) is simply a ticket to the Web. Yet, what is the Web? Where is it? Who owns it? Is it another name for the Internet? Why is it called the Web? What makes it tick? How come it is so important? Why should I care? In this 4th article of our Computational Thinking (CT) series (Vol. 13 to 15, aroundkent. net), we turn our attention to answering these questions and to ways we can make the Web work for us. Continued from page 45 Perhaps the easiest way to understand client and server is to look at an everyday example. We are all familiar with the retail banking service where a customer (the banking client) would visit a bank office (banking host) and seek service from a teller (the banking server). The customer transacts business with the teller using a well-defined language. This customerteller interface language (a banking protocol) involves account number, balance, deposit, withdraw, and so on. Any customer using the banking protocol can work with any teller at any bank. On the Web, the Web client is a program, known as a Web Browser (or browser for short), running on a person’s computer. And the Web server is another program running on a host computer that serves up Web contents. A person uses a browser to access the Web. Well-known browsers include Google Chrome®, Firefox®. Microsoft Edge®, Apple Safari®, and Opera®. Using a browser, you can visit any website where Web server programs are ready and waiting to render services. HTTP (Hypertext Transfer Protocol) is the precisely defined common lan­guage spoken between a Web browser and a Web server. Like our banking protocol, HTTP enables any browser to interact with any server in a standard way. HTTPS encrypts HTTP traffic for security. Fortunately, human users don’t have to speak HTTP; using a browser, all we do is point and click plus a few occasional keystrokes and the browser does the rest. The Web bridges the gap between countries and civilizations, empowers people in cities and rural areas alike, enables individual entrepreneurship, as well as encourages free sharing of information. When is the last time you drove to different stores to find products or to compare prices, visit the library, rent a movie from a store, or buy a plane ticket from a local travel agency? Where can you find yellow pages or white pages phone books? The speed of the Internet makes the actual physical location of a server host less important. Still, a close-by server would deliver contents to you a bit faster than one that is on the other side of the globe. Webpages are coded in HTML (Hypertext Markup Language) that uses markup tags to organize page contents such as headings, sections, paragraphs, pictures, videos, tables, and hyperlinks. Hyperlinks use URLs to connect parts of the webpage to other webpages, as well as other data/services, anywhere in the world. The hyperlinks form an extensive web structure of interconnected webpages and hence the name World Wide Web. Links to different contents such as pictures, audio, video, PDF, and other formats allow the Web to deliver any information to any visitor 24/7. What’s more, URLs can also link to services such as file download, email, phone, skype, GPS coordinates, etc. for one-click/one-tap access. How wonderful is that? The Web brings the whole world to our fingertips and is changing our lives and the way we go about doing things in profound ways. Firing up a browser, we can shop, learn, socialize, listen to music, watch video, play games, invest, and work immediately, from anywhere at any time. The Web is a medium for sharing. People share their pictures, funny videos, plumbing knowhow, recipes, gardening tips, DIY instructions, and so forth on the Web. Individuals sell their crafts, artistic creations, and used books, com­puters, and cellphones on the Web. Looking for information? Find it on the Web. •Y  ou can find images and pictures fitting your description. •Y  ou can find videos and movies to watch. •Y  ou can find products and see reviews from actual consumers who had used them. •Y  ou can find directions to any address, its GPS coordinates and navigate to that location. •Y  ou can find translations between over 100 languages and listen to their pronunciation. •Y  ou can find academic and scientific research articles/books in all fields. Of course, you can purchase all kinds of products and services, many made available only on the Web. You can attend video conferences, do banking, get health insurance, and pay taxes (!) too. What’s more, you can even do mathematics, including algebra, trigonometry, and calculus, on the Web. See these live demos at the Institute for Computa­tional Mathematics (Kent State University): icm.mcs.kent.edu/research/demo.html Indeed, it seems you can find anything and everything on the Web. The Answer Is … Human beings are always curious and thirsty for information. Not so long ago, people with means displayed their prize possession, the Encyclopædia Britannica in their homes. But now, Wikipedia, created and maintained by volunteers all over the world, is free for all on the Web. No matter what questions you have or what information you are seeking, more than likely, the answers are on the Web. All you have to do is to look for it. Web search engines are built precisely for that purpose. A search engine automatically and continuously visits all parts of the Web and stores its findings in huge indexing databases, organized for fast retrieval. Just ask the right question and a search engine can find the answers for you instantly. In this new environment, good Web search skills can be very handy. or more keywords for the search. The search engine looks for webpages containing the given keywords. (holding down the CONTROL key and press +) and CONTROL -. On a touchscreen use the pinch/unpinch gesture. When doing a search it is important to provide the intended context. For example, if you enter subway as the keyword, you may get info on the Subway restaurant instead of a transportation system. If you enter Indians, you may get a baseball team instead of a people. Bookmarks bar—By placing bookmarks on the bookmarks bar, you make it easy to go to oftenused sites. Just select the URL in the Location field and drag it to the bookmarks bar. Often, the title of the bookmark is way too long. You can edit the title by right-clicking the bookmark and edit the title property. It also helps to add year, time, location, and other qualifiers to your search to make it more specific. With a precise and unambiguous search phrase, you often can get good leads immediately. If not, looking at the search results will give you ideas to refine your search. For further information, why not look up Google search tips? Web Browser Tips We all use Web browsers extensively whenever we get online. So it pays to know how to use browsers effectively. Here are a few pointers. Homepage—Every time a browser starts, it automatically loads a desig­nated homepage. Why not make it the most useful site for yourself? Go to your browser control menu (usually three lines or three dots on the top right) and choose preferences to set your startup homepage. Sizing the browser window—Press and hold the left mouse button on the browser title bar (the topmost bar) and drag it to reposition your browser window. Drag a window border to expand or shrink the window. Right click on the title bar to maximize, unmaximize, or minimize the window. Continued from page 47 can install the plugin or extension to your browser right away. HTML for Dum­mies in 24 Hours and “do this yourself” is usually a mistake. your business. This includes encouraging and responding to online feedback from your site. CT: Learn to use your device or app, configure it to your liking, and enjoy. • What are the goals and functions you want your website to achieve? • Who are the intended audiences? • What contents (words, pictures, videos) will the site display? • What operations will the site perform? • Do you have/want a logo for your site? • What visual feel/effect do you wish the site to convey? Warm, cool, funny, serious, friendly, official, allbusiness, or funky? Because the Web is open and world-wide, not everything you read on it is accurate or even true. Hackers can put up a fake website with little difficulty. Therefore, we must be careful when accessing the Web, when entering lo­gin information, when purchasing, and performing financial transactions. A previous article in this CT series talking about cyber security can be a good read: aroundkent.net/cyber-security--how-not-tobe-a-fish.html Teachers should worry about students copyand-pasting information in their homework or term papers. Guess what? You can find free tools, just search for “best tools to check for plagiarism”. Pictures and videos can be altered digitally. News can even be based on rumors. When in doubt, do a Web search and you can soon find the truth. Summary In summary, the Web is part of the Internet where Web hosts store and provide information and programming. The Web has these important technological ingredients: Web browsers—The user agents for the Web functioning as a Web client Web servers—Programs running on Web hosts that deliver Web contents and services HTTP—The hypertext transfer protocol is the language between Web servers and clients. A Ph.D. and faculty member from MIT, Paul Wang became a Computer Science professor (Kent State University) in 1981, and served as a Director at the Institute for Computational Mathematics at Kent from 1986 to 2011. He retired in 2012 and is now professor emeritus at Kent State University. THE SPEEDBUMPS MO’ MOJO Mo’ Mojo is a hard driving, high energy, Zydeco-based “Party-Gras” Band. The female fronted group features three-part harmonies, accordion, fiddle, guitar, rubboard, sax, trumpet, harp, bass, percussion, and drums. The band visited 8 countries in 2014 – 15 (from Central America to Central Asia), spreading the Zydeco gospel as “Cultural Ambassadors” for the U.S. State Department. The new album has a dozen songs: nine originals; two Zydeco standards meant to pay homage to the musical tradition; and one part cover/part original medley based off of Bob Marley’s, “Stir It Up.” It features a Zydeco-base that blends in reggae, Cajun, blues, instrumental, and indie sounds. 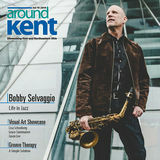 is Sarah Benn, Jayson Benn, joined by Daniel Kshywonis, musicians who call Akron, Ohio home. Our story developed when we — Sarah and Jayson Benn — started singing and crafting songs for our then-infant daughter. As she grew, the music began to take shape and a band was born. Our music was discovered by our friend Dan Auerbach (The Black Keys) when we were invited to perform at his birthday party. The first album was subsequently recorded at Auerbach’s Akron studio, a collection of home-spun dark folk songs and fractured fairy tales called “We All Started in the Same Place”. MIKE HOVANCSEK, MARGOT MILCETICH AND BRAD BOLTON Gayatri by Margot Milcetich, Mike Hovancsek, and Brad Bolton. Gayatri is a traditional Sanskrit chant, recorded on the CD with an original arrangement. The piece was recorded for use in yoga, meditation, and other deep listening experiences. Margot Milcetich performed vocals, harmonium, and chime. Mike Hovancsek performed classical guitar, slide guitar, koto (plucked, hammered, and bowed), sitar, cello, waterphone, water drum, and ragini. Brad Bolton played guitar, bass, and DingDrum. THE OUTSIDE VOICES HEY MAVIS Americana-folk band “Hey Mavis” was born in 2009 as part of the Cuyahoga Valley National Park artist-in-residence program. Producer Don Dixon (REM/Smithereens/Red Clay Ramblers) “discovered” the group on a Michael Stanley Christmas compilation CD and immediately agreed to produce their debut album, Red Wine. The CD quickly climbed the national Folk DJ-L radio charts, peaking at #5 for overall artist while the songs “Red Light” and “Red Wine” peaked at #5 and #9. The CD finished the year at #13 in Folk Alley’s “Top CD’s of 2010” alongside new releases by Tim O’Brien, Peter Rowan, Mary Chapin Carpenter, The Chieftains, and Bob Dylan. MIKE HOVANCSEK AND MARGOT MILCETICH Samadhi is an album of music for meditation, yoga, and other kinds of deep listening. It includes abstract, multicultural music and traditional Sanskrit chants. On this CD Mike Hovancsek played sitar, cigar box guitar, koto, gongs, chimes, plucked piano, classical guitar, e-bow guitar, water glasses, bells, zils, Native American flute, drone vocals, waterphone, water drum, frame drum, and balafon. Margot Milcetich performed vocals and harmonium.